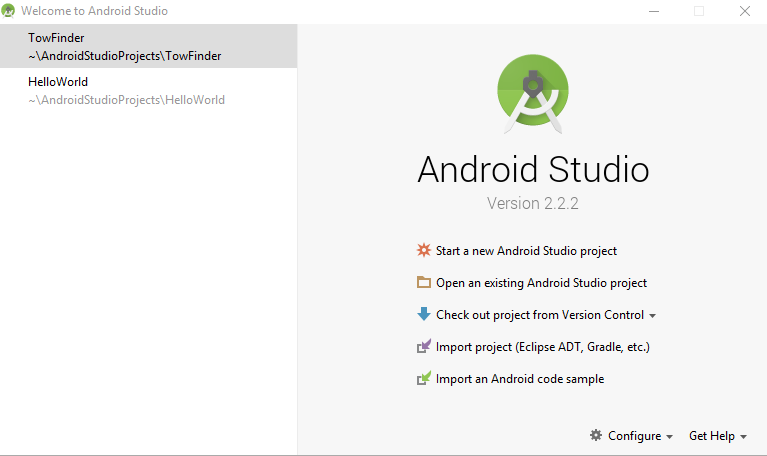 Today I’m going to Introduce and setup Android Studio, the official IDE for android development by Google. It’s available for free for all three major operating systems. I will be using Windows 10 but it should be pretty similar on any platform. 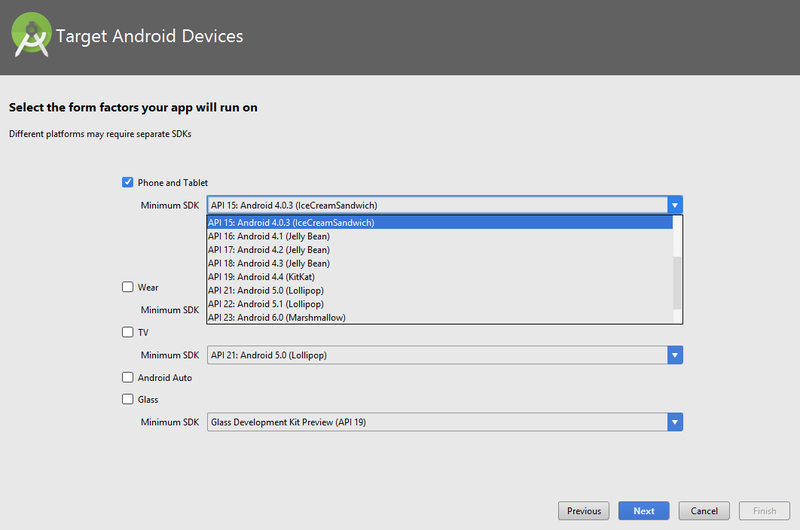 So, begin by downloading Android Studio here. Once you are done downloading the installer , you may run the installer and it will walk you through the installation process which is pretty self-explanatory so I’m not going to go over that. Depending on your system you may also need to install Java JDK. Click on the link below to download and install Java JDK for your system. As you can see in the image above current version of java jdk is 8u111 and I’m downloading the jdk for windows 64 bit operating system. Yours may vary depending on your operating system. After you have installed both the Android studio and java jdk, click on the Android studio icon on your desktop or your windows program list and you will be presented with a screen similar to the screenshot below. Now we are ready to setup our first project. 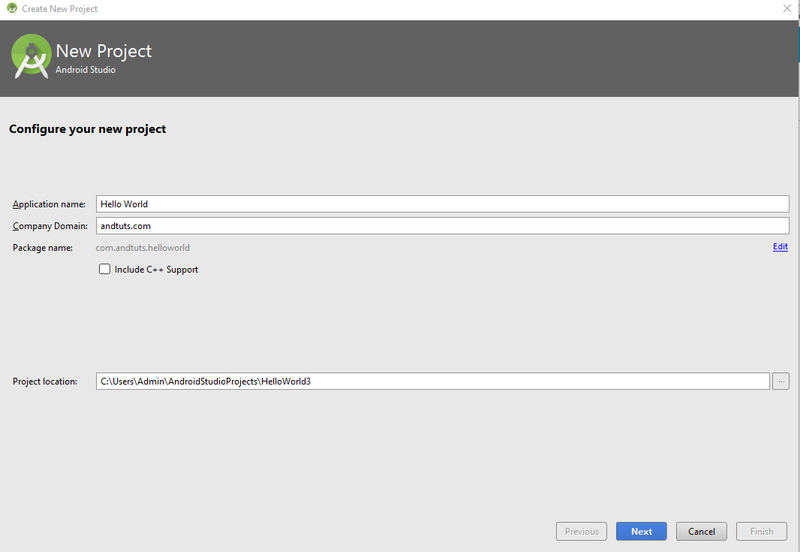 To start a new project click on Start a new Android Studio project and it will ask you for application name and company domain on next screen. I’m using Hello World for company name and andtuts.com for company domain but you can use anything you like. Also, you can click and change the project location where your files will be saved if you don’t like the default location. Next, you will be asked to select a minimum SDK which essentially means what’s the oldest android operating system that you want to ensure that your app runs on as Google constantly releases new updates and versions of Android sometimes the app developed for newer version of android may not run on older version of android so make sure you know just how old of an operating system you want to target to. Once selected it will show you the approximate number of android devices that your app will run on. Next just select the empty activity and leave the default values for activity names and you’re ready to start developing your first android app. I have summarized the entire process in a small gif below. I will go over the next steps in the next blog post. Let me know what you guys think so far.